I remember this from concerts during sound checks. Today’s test was slightly different. And we passed. “We” are the dozens of people involved in getting Pádraig home home. 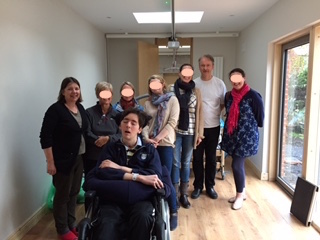 About half a dozen of them arrived this morning at around 7am at the house to make some last fixes, to clean in and around the extension – even to get three huge boards to cover the ground leading in to Pádraigs bedroom door, so that the wheelchair could easily be pushed across. The really thorough, really nice, and really helpful ‘crews’ from the NRH and the HSE arrived with Pádraig at around 11am. We tested the lifts, hoists, bed and other equipment. Pádraig was turned to the left, to the right, and back to the left. He was lifted out of the wheelchair and back into the bed. And he didn’t complain once. Brilliant shower – and jet bath! He must have thought: where are the trees? As all was ready and in order, Pádraig will be staying here tonight. And, if all goes according to plan, he will stay here over the weekend. AND he’ll get discharged from the NRH, again: if it all goes according to plan, on Friday 13th – I’ll be pushing hard for Saturday, 14th. Not because I am superstitious.But you’d never new! In exactly a week’s time it’ll be two years since we left on a jet plane. Tonight, we’re here together. Together. In the Dreamboat! Sheer bliss. I hope you had a good night, although I could imagine that all this excitements might have played against it. But you must be so proud for all what you have achieved!!! I hope all went well last night for you all. Onwards and upwards! HOME So delighted for you all to be together..FAMILY (Pádraig is definitely thinking ♥ Father And Mother I Love You ♥ FAMILY ♥. . precious words and precious time.All because of you and your families monumental ,inspirational vision…Pádraig being the beacon of light that attracts others to action to get ready for HOME. God bless all. Hi Norma – I couldn’t believe the delicious deserts that were offered to Pádraig today… until I saw that note on the white board saying that “a friend named Norma” had left deserts and that they were in the fridge!! Thank you so much!! Thank you, Yvonne. We had a great night! What an amazing milestone!! You have moved heaven and earth to be together at home once again. I hope it all went well. Your family is truly awe-inspiring to accomplish so much with hard work and such strong bonds of love. SO happy for you all! It’s love all around, Diane. Without you, and all the other friends and family, we would long have given up. You don’t do something like this on your own. You wouldn’t be able to without going going down.